Jeremy Wang’s (EngSci 1T7 + PEY) career in aerospace engineering started with folding a simple paper airplane. 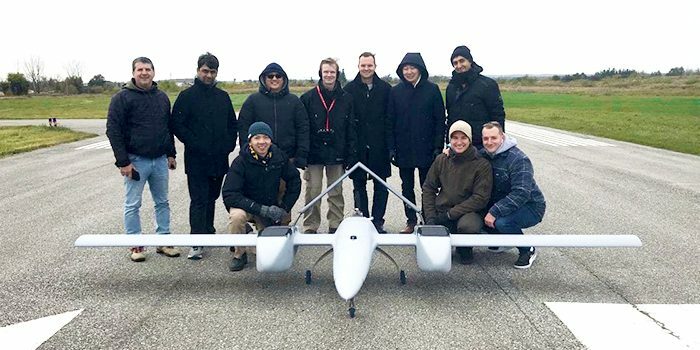 Today, he’s leading a team of designers — including many fellow U of T Engineering graduates — to create and test an ambitious long-range drone capable of vertical take-off and landing. 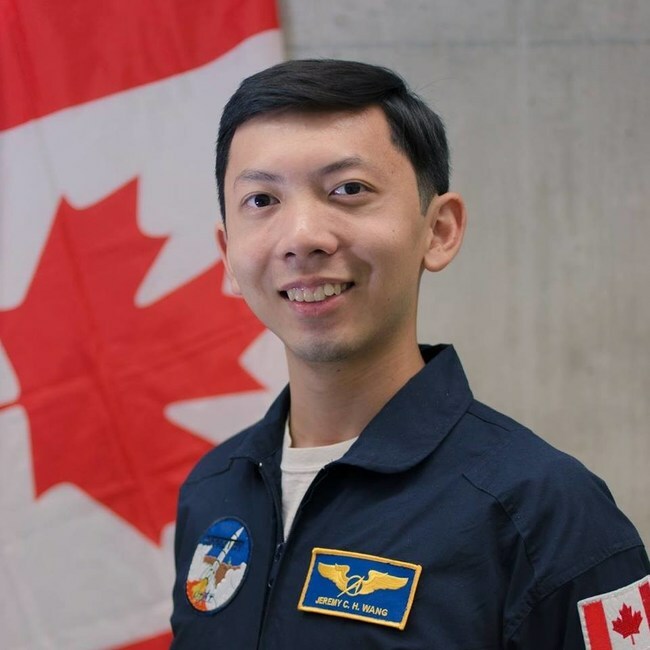 In his first year as an undergraduate, Wang picked up a cleverly-designed paper airplane flyer from the University of Toronto Aerospace Team (UTAT) at the engineering club fair. Wang would eventually become executive director of UTAT, leading a major expansion of the team. His work earned the attention of the Aviation Week Network, which named him to a prestigious industry list of future engineering leaders. But it was his Professional Experience Year co-op position at The Sky Guys that set him on the path to his current project. Now serving as the company’s Chief Technology Officer, Wang still builds aircraft, although not of the paper variety. 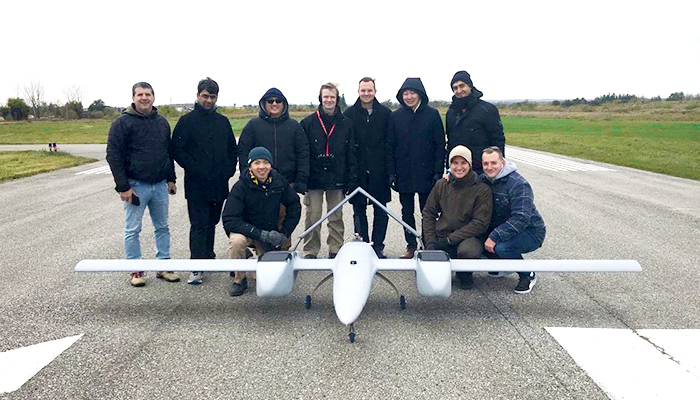 Together with a team of nine, they aim to design an unpiloted aerial vehicle (UAV) that combines the best features of both fixed-wing and multi-rotor drones. Traditionally, fixed-wing UAVS are optimized to fly large distances, but they require a long runway or launch rail to take off and land. By contrast, multi-rotor UAVs can do vertical take-off and landings (VTOL), but are less efficient for long-distance flying and have shorter battery lives. The DX-3 Vanguard features multiple rotors spread across a fixed-wing body, making it capable of handling VTOL before transitioning into forward flight. The hybrid aircraft can theoretically carry a payload of up to 3 kilograms, stay aloft for up to 24 hours, and cover up to 1,500 kilometres before needing to refuel. Wang says that the prototype can communicate via radio, cellular or satellite. “As a pilot, you can be flying the DX-3 Vanguard in Toronto while the drone itself is flying on the west coast of Canada and you can maintain connectivity over satellite link,” he says. It’s also equipped with a cloud-based data management system allowing users to process, upload and view images and video data from the DX3 Vanguard on a secure platform. Such a drone could be used for a wide range of applications. While Wang declined to provide details specific to the DX-3, he reveals that one of the Sky Guy’s key partners is the Ministry of Transportation. The team was awarded a $750,000 innovation grant in 2017 to develop an artificial intelligence-enabled drone to perform highway enforcement tasks. These could include identifying the passenger occupancy of cars in high-occupancy vehicle lanes, speed tracking or monitoring road conditions. Current federal regulations prohibit any drone from flying beyond visual line of sight without a special permit but Wang remains optimistic that regulations will change in the near future. They have begun early-stage testing of the DX-3 Vanguard within visual range at Markham Airport, north of Toronto, with plans to test the equipment beyond line of sight in the future. So far they have evaluated basic functional and performance characteristics, such as conventional take-off and landing, handling the payload envelope and communications. But the biggest challenge the team had to overcome was less technical and more human in nature. 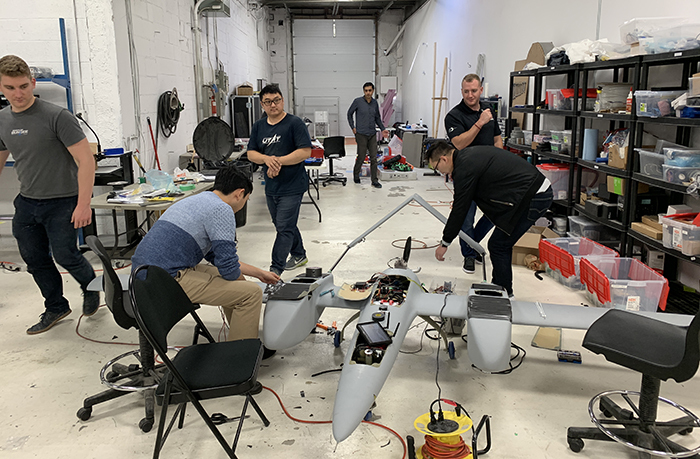 In addition to Wang, the team includes Lucais Kwon (MechE 1T5), Carl Pigeon (UTIAS MASc 1T7), Carson Dueck (MechE 1T5 + PEY), Hussein Khimji (EngSci Aero 0T4) and Thomas Ulph(EngSci Aero 1T6), many of whom were also involved in UTAT.